Cowabunga! Or Booyakasha from the newest installment. 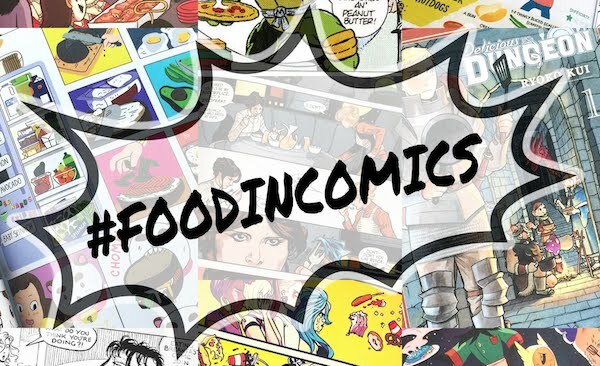 The Teenage Mutant Ninja Turtles have wielded Turtle Power for almost 30 years (in 2014), via comics, animation, live-action, video games, and merchandise. My sister and I watched the cartoon religiously in the late 80s to mid 90s and loved the three live action movies. I totally would have taken martial arts as a kid if I had been brave enough, but instead pretend ninja'ed all over the place with makeshift bo staffs, swords, and nunchucks (I can't remember if we ever rigged up sais). I'm so curious about the new turtles movie coming out next summer and am glad that the TMNT creators Laird & Eastman have been involved. 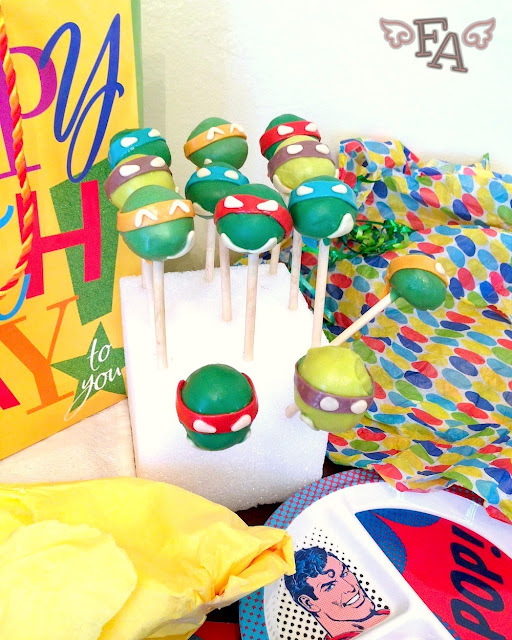 These tasty pops were made for Smalls' birthday because she's a second generation Turtles fan (I swear we don't push her into this stuff!) and because I think cake pops work really well for toddlers. And for 20 somethings. And 30 somethings. I'm posting this today because the new Turtles game, "Out of the Shadows", releases this Wednesday (August 28, 2013 for Xbox 360 and Steam [PC], and then September 24, 2013 for Playstation 3). 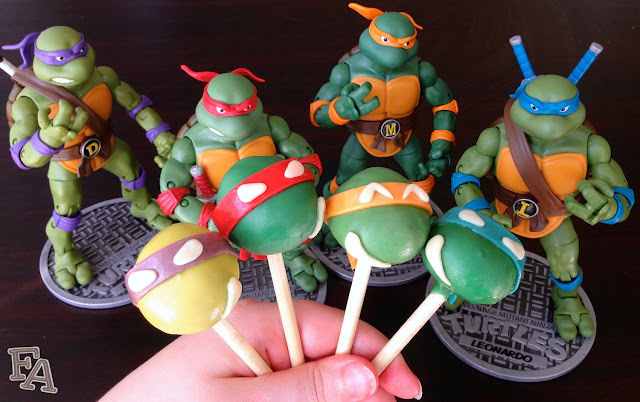 Note: This post is more of a how-to for decorating your cake pops to look like Ninja Turtles rather than a recipe (the cake pops recipe can be found here). I used Tootsie Fruit Rolls and Frooties (also from Tootsie). If you can't find these specific candies, you can use colored fondant which can be handmade (recipe here) or found at Michaels. The cake flavor you use is completely up to you (I used red velvet). 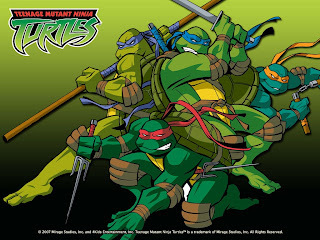 Also, depending on the TMNT series or what promotional images you look at (like the one above) you'll notice that the Turtles are often depicted with specific shades of green. 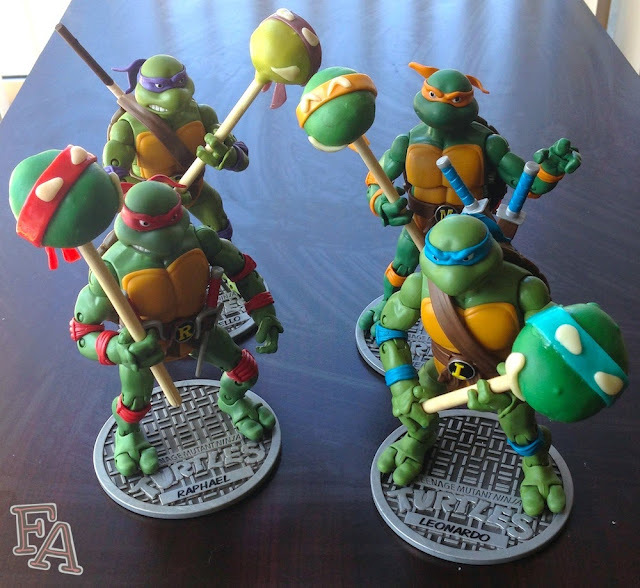 Donatello is usually the lightest green and Raphael is usually the darkest. Michelangelo is often shown as a blueish green or a light green and Leonardo is plain green. I used two different candy melt greens and did a little combining, but you can do whatever you like. It's really the masks that make the pops anyway. Styrofoam Block, or something else that the cake pops can stand upright in after being dipped. 1. Follow the directions for making cake pops. To form the turtle heads roll the mixture into balls & then make an indentation on each to create the smaller top of the head & the more protruding mouth/nose area below. While they are forming up in the freezer continue to follow the cake pop instructions by melting the candy melts & then dipping the solidified pops in small batches. 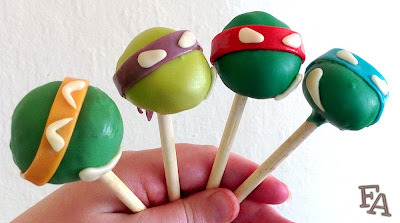 Dip all of your cake pops & let them harden. 2. 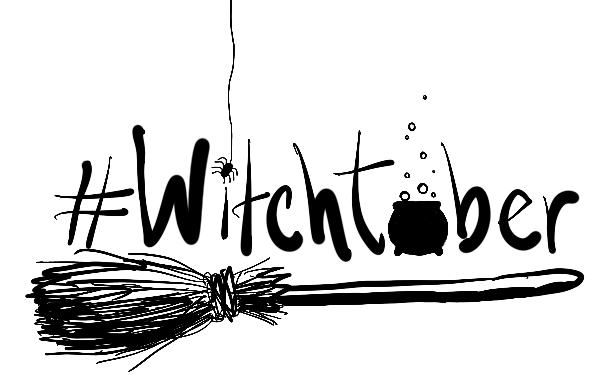 Unwrap the Tootsies & Frooties & work them one at a time in your hands until they are pliable. Flatten the candies as much as you can, using a rolling pin or cup. Next, cut the flattened candies with a knife or pizza cutter into the needed shapes: vanilla into eyes & mouths by cutting triangles & rounding them out a bit into tear drop shapes (you can see from the pictures that I gave Michelangelo happy closed eyes), & red, purple, blue, & orange into bandana strips & ribbon end bits. 3. 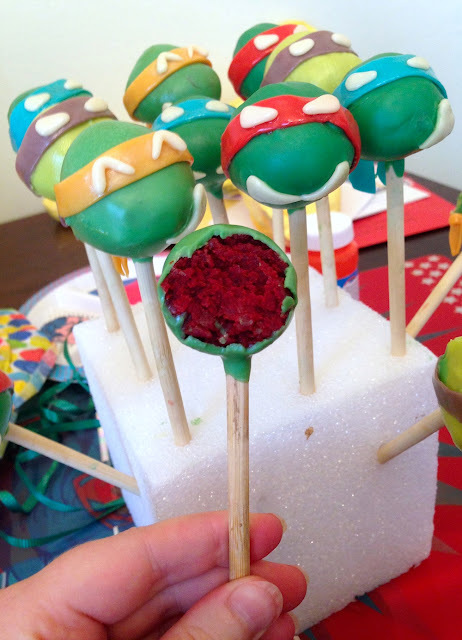 Place the candy bandana strips onto the green coated cake pops (the stickiness of the candy will make it stay on the pops), gently stretching the strips if needed to go all the way around. On the back of each turtle head, where the bandana ends meet, stick on a couple of candy strip bits to make it look like the bandanas are tied on. Next, carefully stick the flat vanilla eyes onto the bandanas & then stick on the vanilla mouths. If at any point you find the flattened candy is not sticking properly you can use tiny toothpick dabs of melted chocolate to hold the bits in place. My husband ordered them on Amazon. Look for the Ninja Turtles Classic Collection. Good luck!